The Damakola Patuna is a very significant Buddhist religious destination, which is also called as Jambukola Patuna. It is an ancient port in the Jaffna District which was used during the pre-Christian era. This place was restricted to tourist activities during the earlier times but now it can be accessed easily. It is located on tip of an island in the Jaffna district of Sri Lanka. It is very easy to locate since it is situated along the coast. There is a legend related to this temple. Their Sanghamitta arrived at this place with the Bo sapling. The King Devanampiyathissa arrived at this place to welcome the guests. The Damakola Patuna was built to commemorate this event. This legend highlights the importance of this location. The present Bo tree was the sapling of the revered Bo tree in Anuradhapura. Most of the originals structure of this place has been lost due to the civil wars, and only a very small part of it remains. The existing sculptures, paintings and stupas that you will find there have been recently built. 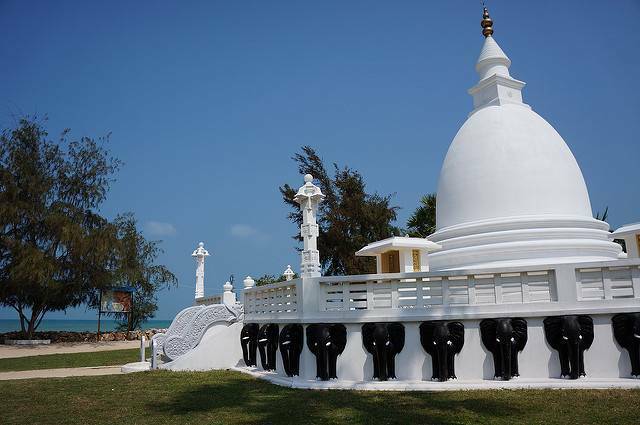 The Damakola Patuna Sangamitta Temple is historically important place in Jaffna and it reflects the Buddhist culture prevalent throughout Sri Lanka!